Do you like making high-stakes decisions? Are you tempted by “all or nothing” investments? If you have been researching investments in search of high yield, low-risk investments, you may have come across something called, “binary options.” You may have even been sent an email or a message on social media asking you to look at a sales pitch. You should be aware these pitches are often nothing more than frauds using flashy, high-pressure sales tactics to try to rob you of your hard-earned money. There are unique characteristics and risks associated with all or nothing investment opportunities and there are several warning signs that might indicate the investment you are considering is really a scam. Taking a few minutes to educate yourself can prevent you from losing your life savings. The Basics – A binary option or all or nothing type of options contract involves a payout that depends entirely on the outcome of a yes or no proposition. When the option expires, the investor receives either a set amount of cash, or nothing at all. For example, you might pay $50 for a binary option contract that promises a 50 percent return if the company’s stock price goes above $5 when the option expires. So what happens if the stock doesn’t go above $5 by the time the option expires? Put simply, you lose ALL or nearly all of the money you invested, very fast. You take a huge risk when investing in these kinds of options, and you have to be comfortable with that level of risk. 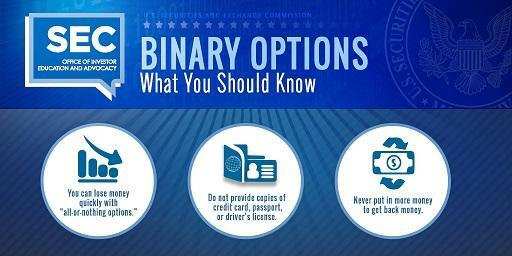 Consider This – Be aware that binary options operators may not comply with the federal securities laws. That could mean they offer unregistered securities or operate as an unregistered broker-dealer or securities exchange. But the biggest risk is that binary options operators may actually be trying to scam you. Many fraudulent exchanges are offshore and unregulated by U.S. laws, which can ultimately mean that they are beyond the reach of U.S. law enforcement. If you get scammed by one of these operators, it may be virtually impossible to get your money back. Know the risks, do your research and learn more about investing wisely on Investor.gov, the Securities and Exchange Commission’s website for investors.